Enter your nickname and email adresses on in this dialog box NOTE: do NOT enter anything that you don't want anyone to see. If you don't want everyone to have your email address then do not enter it here. Type the name of the Subject header in the text box pay close attention to the variables and the Example section. This is what people will see when they view your post in thier news readers. Check the box of the newsgroup(s) you would like to post to. You may click the "Add Group..." button and type a name of a newsgroup not yet listed. 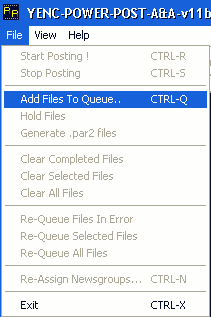 To begin posting In the main menu click File/Start Posting! A posting progress window will pop up to show you a bunch of info about your posting. This page was last edited on 22 May 2006, at 22:55.